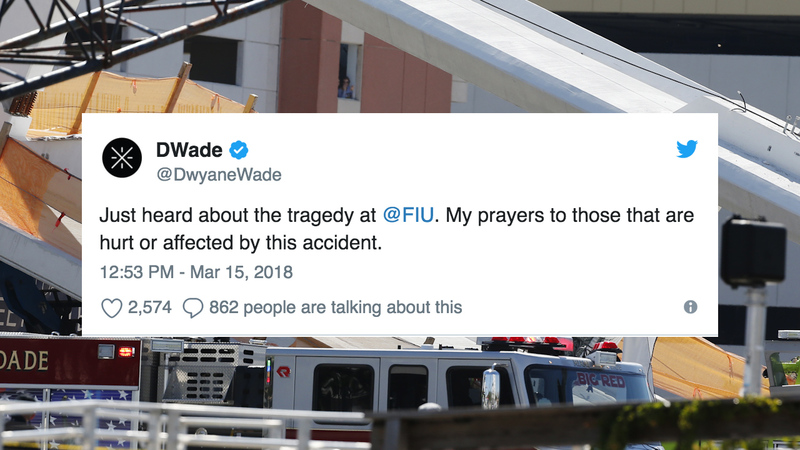 MIAMI -- A bridge collapse at Florida International University has left several people dead and several more injured, according to authorities. Many politicians and other notable figures have taken to social media to share their condolences with the victims and their families. The City of Miami extends its heartfelt condolences to the friends and family of the victims of today’s bridge collapse in Miami-Dade County and we wish all survivors a speedy recovery. We are closely monitoring all developments.
.@RepCurbelo: My staff, family and I are thinking of all those affected.I am grateful to the first responders and medical professionals on the scene for their immediate response and all the work they will do in the hours and days to come. My alma mater, @FIU, needs your prayers today for the victims of the horrible bridge collapse and the university community. Every Panther mourns this afternoon. Just heard about the tragedy at @FIU. My prayers to those that are hurt or affected by this accident. To all our friends in the @FIU community, we are thinking of you with heavy hearts. Our thoughts are with the @FIU Community during this tragic time. My staff and I are closely following developments following the collapse of a pedestrian bridge at Florida International University. Praying for everyone and thankful for the heroism of first responders on scene.